A multi-effects processor attempts to recreate the sounds of many different stomp boxes via digital modeling, all in one box. They are usually larger than a regular analog pedal and the classic guitarist’s debate is which are better, multi-effects units or single stompboxes. Oftentimes it’s a mix of both… Though pure bang for your buck may steer you to the multi. One thing to consider is how you are going to use your pedal(s). If you are just starting out, (and you ain’t got no money! ), and want to sample a bunch of different sounds, then you might want to go with a multi-effects box. You’ve got a ton of different sounds to play with–it’s a knob tweaker’s paradise. Especially if you are on a budget, a multi-effects unit can open up the world of phasers, flangers and ring modulators. And then later, when your ear (and wallet) are ready for a little more, you can go for the classic sounds of a dedicated, analog stompbox like an MXR or Fuzzface. Here are some good reasons for both. Don’t lie to your Momma. Tell her you want it because looks cool. 1. Analog Sound: Purists will claim that stompboxes will always be superior to digital multi-effects due to their analogue circuitry. To them, digital is a bit sterile, without the organic and evolving textures that classic guitar pedals can give. 2. Ease of Use: With their volume, tone, and effects dials mounted on top, your sound can be changed easily with an analog effects pedal. Back off the gain slightly here, ratchet up the phase there, a simple turn of the knob and you get the tone you want. Compare that with the tedium of scrolling through menus and settings that you get with multi-effects units. Menu-Settings-Distortion-Gain-Level-Yawn! And don’t forget to hit save twice or you’ll have to do it again! Compared with this, pedals are a model of simplicity and ease of use. 3. Mixing It Up: When building your pedal board, you can put the classic sounds of all the different effects giants together. Start off with your Vox wah for the Hendrix sound, mix it with a Boss DS-1 for that Cobain wail, then maybe an Electro Harmonix Memory Man for that Edge-style delay. Get a multi-effects unit and you’re pretty much stuck with that company’s sounds, or their approximations of what they think are classic sounds. 4. Looks: A row of stompboxes just looks cooler than a multi-effects board, enough said. It slices. It dices. It also serves as a usb interface so you can record stuff on your computer! 1. Power Supply: Although it won’t last as long as a single pedal, one of the main benefits of the single multi-effects unit is that they only require one power source. Get yourself a good adapter and you are sorted. You can of course buy a dedicated pedal board that comes with its power supply for your stompboxes, but that’s going to cost you. 2. Pre-Programmed Sounds: Even the cheapest budget multi-effects unit will have a large selection of effects and sounds, and patches to store your sounds on. Instead of dancing around the pedal board then in the middle of songs, you can preset your sounds and move between them easily in the course of the song without any hassle. 3. Don’t have to buy/carry around a ton of short cables: Another cost saved with the multi-effects unit are the short leads that you won’t have to buy to connect all the stompboxes together. An added bonus to this is that you’ll often find that one of those leads will be creating a buzz, and you’ll have to go through each one to find the problem. Another little hassle avoided with the multi-effects unit. They also provide noise gates to get rid of any hiss and hum from your sound if you use a lot of gain or fuzz. 4. Portability: You’ll save yourself a lot of effort if you have all your sounds programmed into the multi-effects unit rather than needing a whole board full of pedals if you’re a gigging guitarist. Single pedals also have a habit of growing legs after gigs, so you’ll be glad if you only have one unit to keep an eye on apart from your guitar and amp. 5. Variety: Unless you’re rich or a particularly skilled thief, it’s going to take you a while to amass all the sounds you get from a single multi-effects unit with single stompboxes. Also, bear in mind that multi-effects won’t just include one type of reverb or delay either, they have a selection, as well as your distortions, overdrives, fuzz etc. all in one pedal! …as always, let your budget and ear make the final decision. If you’ve only got $100 to spend then maybe you go with a multi-effects processor. If you’ve got $100 now, and maybe could fork out $100 later, then you might start picking up individual pedals. Then let your ear be the final judge. I personally like multi-effects processors for all the reasons mentioned. two biggest complaints though is the very limited (if any) control over the order of effects. For example, it might seem perfectly sensible to 98% of multi-effects makers to always put the compressor before the distortion/overdrive in the effects chain. But if you want that old Led Zeppelin effect, of being able to slowly crank the volume control on your guitar and go from light crunch to full on distortion without the volume changing much, then you need to wire it the opposite way. And there is no changing wiring (or effects chain order) in most "all in one" pedals. Thanks for the reply, Randy. Yeah, the multis are limited in effects chain order. They'll never truly replace analog effects but are fun to play with. i have a boss me 50 and i like theway they make or model many of their own sounds however if you want to add anything to the chain loop with a digital multi fx it cannot go before said pedal chain order is multi fx then analog then amp or in some cases fx amp analog cabinet . i nearly returned an eq pedal because i didn't know this but once i tried it after the me-50 i realized the modeling nullified most of the analog effects. Thanks for the info Stephen and sorry for the amazingly late reply! I own a multi pedal, as well as a few jam mates from a while back. Tried to replace my tangle of stomp boxes. I will admit, all of our pedals are dated, late 90's, so I know I achive nothing in saying that my old DOD chorus and flanger pedals and the built in my amp spring reverb sounded much better than the multi's, but we all had one major problem; Very fragile power supplies with thin cords and odd-ball ends that were discontinued and now two of 3 said pedals can't even be used anymore. I do not remember my buddy's models, but mine was a Digitech RP7Valve. Mine is the only one out of those three still useable. The common problem of multi effects, are the fixed chain, you cannot put the modulation like chorus before the distortion, to simulate old school cranked amplifier like EVH or Rush in 70's. Analog effects give you a vast way to create sounds, you can mount your chain as you like, but every time you need other effect, you'll have to think how supply and where you will put it.But in digital multi effects you have a bunch of effects in one place, may using analog effects in same chain with the digital you can create new tones, and new sounds, and find what you want, with a medium cost. Buying multi-effect was kinda disappointing for me. I was low on money, so I spent 90 bucks on G1Xon and gave it a try. I would say this thing is pretty cool, just not for my ears. Effects for clean sound were great - I like playing ambient music and stuff - but distorsion effects were terrible. I just couldn't handle that digital sound (I tought i could). So I borrowed it to my friend and he was excited so much that he bought it from me. So "multi-eff or stompbox" is actually the same question as "Tube or solid-state" ... you can't say which is better because it depands on what you like more. Hi! Certainly I have a limited set of experience of Zoom and Korg multieffects, but I can say, that if you are using distortions heavily, forget digital multieffects. Even, if you use an analog distortion pedal and then connect a digital multieffect after for flanger or chorus effect, it won't sound very good. Maybe the delays and reverbs will be OK. But anything else just wont sound clear and right. I started with a Korg AX-1000G (I think that's right). I do mostly church stuff and am also really enjoying ambient discovery. The Korg finally felt old and constricting but the variety of sounds and effects that I seek are simply not affordable in individual pedals. Add to that the ability to quickly switch live to another setup with a completely different sound and with the stompboxes, you're doing a dance on the pedalboard that includes alot of bend-down-and-touch-your-toes. At 55, I'm not too keen on that. So I moved up and got a Digitech RP500. I was looking at the top of the line Boss or Line 6 multi-effects but couldn't swing it. Does the Digitech do EVERYTHING. No. My old Korg had a ring modulator that the Digitech doesn't, for example. The Digitech is definitely oriented towards Rock/Metal even though that's not my style. BUT it has some limited signal chain flexibility as well as Amp modeling (lots of amp choices) as well as the ability for each (user and factory) preset to turn off/on compression, distortion, chorus/fx, delay and reverb. All this without bending down. 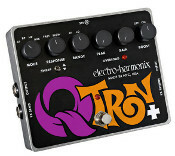 Additionally, there are two LFOs that you can define to create vary effects, noise gates, swells (without having to use the pedal) and, of course, as the article mentioned, for each effect (chorus, effects, reverb, distortion, delay, reverb, compression) you have multiple choices and parameters. Is it perfect, no. I'd change some things. Does it sound good - to my ear it does, but I'm not some sort of tone-god either. I thrive on variety of sound more than "purity" of sound and my level of technique isn't going to mistake me for any of the people I'd love to sound like so for me, that's just not as vital and I'd think that for many folks it's really less vital than they think. I love to use the software that comes with it and discover what sounds I can create by layering different things, etc. It's really been incredible what I've been able to create. It's just under $200. For the money, you can't touch that with stompboxes and we're not even talking top of the line multi-effects pedals.